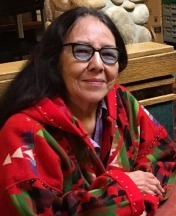 Lois Red Elk Tells Different Tales From "Little Red Riding Hood"
Little Red Riding Hood was brought to North America from the Old World but Red Elk knew different ancient stories about the relationship between people and wolves. 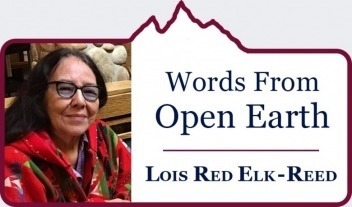 By now you know that Lois Red Elk is a polyglot. Raised speaking Dakota and Lakota by her elders, she took up English in school but has distinguished herself most by understanding the languages of the land, the other beings we share it with, of the wind, sky, and stars that possess their own animism, and of words that stand in for feelings, instincts and spiritual power, that can never adequately be described phonetically or spelled with letters of an alphabet. I lie looking at the log wall parallel to the length of the bed, and run my fingers along the frost between the logs. Quickly I feel for safe warmth coming from under the patchwork quilts covering my body. I wondered about the cold trying to come into the log house. The wind singing into the chimney sounded like an echo from the wolf I heard last summer. Maybe it was the wolf, trying to come into grandma’s warm house, talking to me through the gusts of wind. If I listened carefully, the high whine was like words slipping in our deep woods from branch to branch. Snow and frost covered the area where the wolf lived, but I knew he was there, under the rocks above the creek. Maybe if I shut my eyes real tight and dreamed real hard the wolf would come to the door and I would let him in so he could warm-up near the fire. The meal was already set on the table when I got up. Grandma wasbusy making herself coffee. I sat daydreaming, the sound of the howlstill ringing in the story in my mind. Grandma asked how I slept and I told her I thought I heard a wolf and wanted to watch out the window. a large shaggy wolf. Grandma sat looking at me and smiled. She said the wolves are taking care of their own family and are nice and warm in their thick furry coats. After breakfast I got dressed and followed her around the house, still curious about the wolves. She said she would tell me a story later about a woman who got lost and the wolves saved her. Satisfied with that, I sat and helped her comb out her long braids, then we washed the dishes. Again a howling swept through the chimney and I thought about being lost and a friendly wolf finding me and keeping me warm. Grandma said she had a piece of tin and was going to ask grandpa to wrap it around the chimney so the snow wouldn’t float in. As I wiped the bowls and spoons, grandpa came back from feeding thehorses. He said he saw a lot of deer tracks in the brush and was going to go out and get a deer. I told him he had to wrap some tin around the chimney because the snow was coming in. He laughed and said he’d take care of it after he came back. All afternoon, grandma sewed. She put patches on grandpa’s pants and patches on the blankets. I wondered how far grandpa had to go to get the deer and thought about the wolves. Maybe he would see them and let meknow what they were doing. When grandpa got back I was sound asleep and didn’t see the deer and porcupine he brought back. When I woke up I smelled bread and soup and something sweet. Grandma had made a pie. I told her I had a dream about a wolf drinking water from the creek. 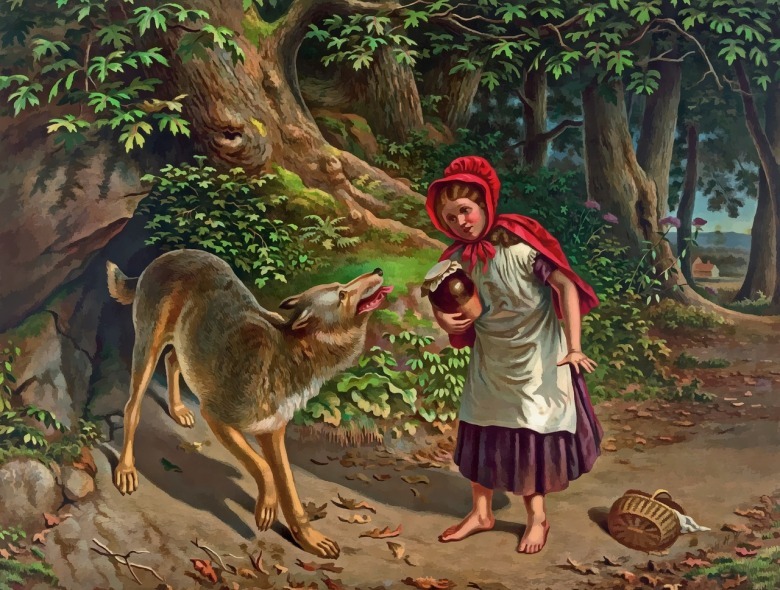 She smiled and said grandpa saw a wolf by the creek, drinking and expected it to run away, but it just stopped, watched him then slowly trotted away. I was thinking that was my wolf, the one I heard that morning. I shared that with grandma. Again she smiled, and said, it probably was. I’ve always known that stories told to me as a child were examples to guide my adult life and I also knew a story would eventually leave the metaphor and become a life lesson. When I wrote, “Once Upon a Wolf” I had to follow up eventually by sharing the story of “The Woman Who Lived With Wolves, an ancient Dakota/Lakota story. I’m enclosing a brief version of that story here. In my culture the Wolf represents the hunt and war. To enable a person to receive the knowledge of hunting and war preparation, a person had to dream of wolves. Our dream societies were numerous and the dreaming of wolf, the patron of warriors, introduced one into the Wolf Society. It became their ultimate supernatural power. 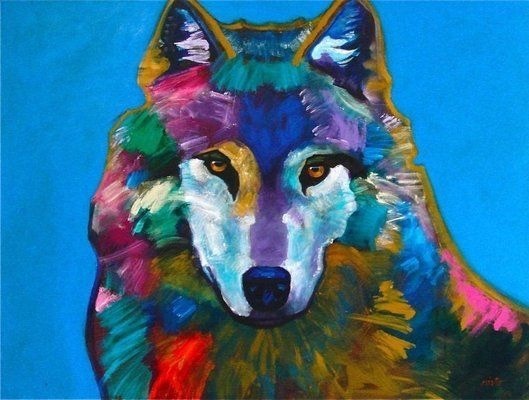 Wolf Dreamers possessed an intuition for a sense of the nearness of danger, strategic planning and being successful in their defeat of the enemy. There was great ceremony in preparing for war which included prayer, offerings and communications. This ceremony invited the wolf spirit to the warrior. During the time I was writing, "Once Upon a Wolf," I had several dreams of wolves. I was living and working in Cheyenne country at the time. One weekend, my husband and I were returning to our home in northern Montana. It was late and we were about 20 miles out of town when I sensed the presence of an animal ahead of us. I told my husband to slow down as deer often crossed the road in that area. Just as we started up a hill I saw movement on the east side of the highway then saw a large pair of eyes coming out of the coulee. 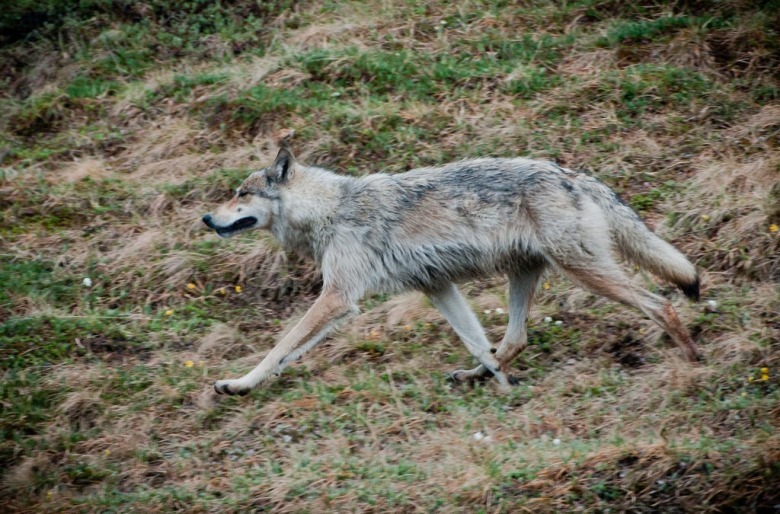 As my husband slammed on his brakes a large wolf sauntered across the road in front of us. My husband looked at me with a renewed sense of belief and shook his head. I nodded and acknowledged the presence of Shung-mani-tu Tanka, a large male wolf. I whispered, “Wopila"—thank you. After the wolf crossed to the other side, it paused, turned slowly to look at us, then hurried West. It was a sight I will never forget. I remember some words my father shared with me when I was trying to draw composites of the four-legged animals. I couldn’t capture the spirit that I wanted. Father said I needed to dream about it. This is a belief of our dream societies. Such a brilliant insight from our culture. I later dreamed of animals, many times as a matter of fact and was able to feel then see the images I wanted in my drawings. So with writing poems, I often dream of subjects, sense them, hear them and most importantly, the subjects give messages of their life. They speak with me, many times in my Dakota dialect. The second time I saw the wolf, it was in the same area, about the same time of day. We were traveling home when I began thinking of the first encounter. I was peering out the car window then thought to roll the window down. The plains in this part of the country are rolling and covered with sage, wild grasses and little coulees. It is easy to miss seeing deer, porcupine or scurrying pheasants unless you live here and have cultivated a watchful eye. Again, I saw movement in the distance on the East side of the road. About 30 feet out, a shadow seemed to be running along side of the car. I strained to look and told my husband to slow down. I thought about the wolf then thought that this shadow was too large. Maybe it was a calf. As we descended down a little incline the shadow ran closer to the highway, dodging and leaping over the sage. When we reached the bottom of the little hill, I saw that the shadow was indeed a large wolf. I’m sure it was the same one we saw two weeks earlier.